What is corn silk? Why do we need it? Corn silk pertains to the thin, threadlike material found at the end of a corn husk. It ranges in color from light yellow to brown, and can reach more than a foot in length in some species of corn. As part of the corn plant, its main function is to catch pollen. 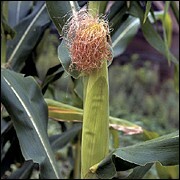 As a medicinal, however, corn silk brings with it a wealth of uses rarely seen in most botanicals. It is typically harvested during the summer, when corn ripens, then separated and dried before being used in herbal remedies. According to the foundations of traditional Chinese medicine, corn silk has sweet and neutral properties, and is associated with the Bladder, Gallbladder and Liver meridians. It functions as a diuretic and helps reduce the incidence of swelling and edema. Corn silk is believed to exert a positive influence on the kidneys and urinary system, helping to prevent the formation of kidney stones and stones in the urinary tract. In addition, corn silk can help lower blood pressure, reduce blood sugar levels, and help promote blood clotting. Corn silk also has mild antiseptic properties, making it effective in the treatment of minor wounds and infections. How much corn silk should I take? The typical dosage of corn silk is between 15 and 30 grams, boiled in water and drunk as a decoction. To treat urinary tract infections, some practitioners may recommend an infusion of corn silk taken up to three times per day. It can be used either fresh or dried. What forms of corn silk are available? Fresh corn silk can be found, along with fresh corn, at many supermarkets, along with Asian markets and herbal shops. Dried corn silk is also available, as are corn silk powders and pills. What can happen if I take too much corn silk? Are there any interactions I should be aware of? What precautions should I take? Corn silk is considered extremely safe; the American Herbal Products Association has given it a class 1 rating, which means that it can be safely consumed when used appropriately. However, because it promotes the coagulation of blood, patients taking anti-coagulant medications such as warfarin should not take corn silk without first consulting with their health care provider. As always, make sure to consult with a licensed health care provider before taking corn silk or any other herbal remedy or dietary supplement. Chen JK, Chen TT. Chinese Medical Herbology and Pharmacology. City of Industry, CA: Art of Medicine Press, 2004, pp. 424-425. Gruenwald J, Brendler T, Jaenicke C (eds.) PDR for Herbal Medicines. Montvale, NJ: Medical Economics Company, 2000, pp. 224-225. McGuffin M, Hobbs C, Upton R, et al. (eds.) American Herbal Products Association's Botanical Safety Handbook. Boca Raton, FL: CRC Press, 1997, p. 125. Yu mi xu. Available online.